There are reports of spontaneous regression of large extruded disc; however, the exact underlying mechanism and management of such cases remains controversial. We report a 40-year-old female who opted for conservative management for a large extruded lumbar disc. Follow-up magnetic resonance imaging (MRI) showed complete disappearance of the disc fragment; however, there were degenerative changes in the upper and lower adjacent margins of the vertebral body. Spine surgeons should be aware of spontaneous regression of the disc phenomenon as a patient with a large extruded disc who opted for the conservative management initially can have persistence pain, but there may not be an underlying protruded disc. 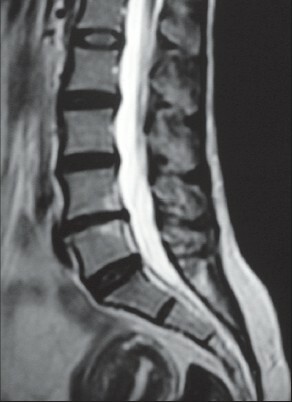 A 40-year-old female presented with low back pain of 2 year duration. The pain was radiating to lower limbs more to the left side. There was no history of motor or sensory deficits. There was no history of bowel or bladder dysfunction. She was investigated for the similar problem with an MRI 6 months back and it showed a large disc protrusion [Figure 1]. However, she opted for conservative management. On examination, there were no focal motor or sensory deficits. Deep tendon reflexes were normal except bilateral sluggish ankle jerks. Planters were flexor. As the patient was complaining in the severity of the pain with numbness and a repeat magnetic resonance imaging (MRI) was performed. Follow-up MRI showed complete disappearance of the disc fragment; however, there were degenerative changes in the upper and lower adjacent margins of the vertebral body [Figure 2]. Present case illustrates that a conservative approach can be adopted for a large extruded lumbar disc as it can resolve in a selective group of patients. ,, Spine surgeons should be aware of spontaneous regression of the disc phenomenon as a patient with a large extruded disc who opted for the conservative management initially can have persistence pain, but there may not be an underlying protruded disc. It is important to perform a repeat imaging of the spine to assess the degree and severity of the disc protrusion before making a plan for surgery or any further conservative management. 1. Hakelius A. Prognosis in sciatica. A clinical follow-up of surgical and non-surgical treatment. Acta Orthop Scand Suppl 1970;129:1-76. 2. Saal JA, Saal JS. Nonoperative treatment of herniated lumbar intervertebral disc with radiculopathy. An outcome study. Spine 1989;14:431-7. 3. Saal JA. Natural history and nonoperative treatment of lumbar disc herniation. Spine 1996;21:2S-9S. 4. Saal JA, Saal JS, Herzog RJ. The natural history of lumbar intervertebral disc extrusions treated nonoperatively. Spine 1990;15:683-6. 5. Sei A, Nakamura T, Fukuyama S, Ikeda T, Senda H, Takagi K. [Spontaneous regression of lumbar hernia of the nucleus pulposus. Follow-up study of 4 cases by repeated magnetic resonance imaging]. Rev Chir Orthop Reparatrice Appar Mot 1994;80:144-9. 6. Postacchini F. Results of surgery compared with conservative management for lumbar disc herniations. Spine 1996;21:1383-7. 7. Ahn SH, Ahn MW, Byun WM. Effect of the transligamentous extension of lumbar disc herniations on their regression and the clinical outcome of sciatica. Spine 2000;25:475-80. 8. Bozzao A, Gallucci M, Masciocchi C, Aprile I, Barile A, Passariello R. Lumbar disk herniation: MR imaging assessment of natural history in patients treated without surgery. Radiology 1992;185:135-41. 9. Delauche-Cavallier MC, Budet C, Laredo JD, Debie B, Wybier M, Dorfmann H, et al. Lumbar disc herniation. Computed tomography scan changes after conservative treatment of nerve root compression. Spine 1992;17:927-33. 10. Komori H, Shinomiya K, Nakai O, Yamaura I, Takeda S, Furuya K. The natural history of herniated nucleus pulposus with radiculopathy. Spine 1996;21:225-9. 11. Matsubara Y, Kato F, Mimatsu K, Kajino G, Nakamura S, Nitta H. Serial changes on MRI in lumbar disc herniations treated conservatively. Neuroradiology 1995;37:378-83. 12. Modic MT, Ross JS, Obuchowski NA, Browning KH, Cianflocco AJ, Mazanec DJ. Contrast-enhanced MR imaging in acute lumbar radiculopathy: A pilot study of the natural history. Radiology 1995;195:429-35. 13. Cribb GL, Jaffray DC, Cassar-Pullicino VN. Observations on the natural history of massive lumbar disc herniation. J Bone Joint Surg Br 2007;89:782-4. 14. Lapuyade G, Loustau JM. [Spontaneous regression of disk herniation. Apropos of 7 cases]. J Radiol 1989;70:697-702. 15. Ellenberg M, Reina N, Ross M, Chodoroff G, Honet JC, Gross N. Regression of herniated nucleus pulposus: Two patients with lumbar radiculopathy. Arc Phys Med Rehabil 1989;70:842-4. 16. Keskil S, Ayberk G, Evliyaoðlu C, Kizartici T, Yücel E, Anbarci H. Spontaneous resolution of "protruded" lumbar discs. Minim Invasive Neurosurg 2004;47:226-9. 17. Ushewokunze S, Abbas N, Dardis R, Killeen I. Spontaneously disappearing lumbar disc protrusion. Br J Gen Pract 2008;58:646-7. 18. Ryu SJ, Kim IS. Spontaneous regression of a large lumbar disc extrusion. J Korean Neurosurg Soc 2010;48:285-7. 19. Kil JS, Eom KS, Park JT, Moon SK, Kim TY. Spontaneous regression of lumbar herniated intervertebral disc. Korean J Spine 2010;7:34-6. 20. Guinto FC, Hashim H, Stumer M. CT demonstration of disk regression after conservative therapy. AJNR Am J Neuroradiol 1984;5:632-3. 21. Teplick JG, Haskin ME. Spontaneous regression of herniated nucleus pulposus. AJR Am J Roentgenol 1985;145:371-5. 22. Masui T, Yukawa Y, Nakamura S, Kajino G, Matsubara Y, Kato F, et al. Natural history of patients with lumbar disc herniation observed by magnetic resonance imaging for minimum 7 years. J Spinal Disord Tech 2005;18:121-6. 23. Bush K, Cowan N, Katz DE, Gishen P. The natural history of sciatica associated with disc pathology. A prospective study with clinical and independent radiologic follow-up. Spine 1992;17:1205-12. 24. Benson RT, Tavares SP, Robertson SC, Sharp R, Marshall RW. Conservatively treated massive prolapsed discs: A 7-year follow-up. Ann R Coll Surg Engl 2010;92:147-53. 25. Autio RA, Karppinen J, Niinimäki J, Ojala R, Kurunlahti M, Haapea M, et al. Determinants of spontaneous resorption of intervertebral disc herniations. Spine (Phila Pa 1976) 2006;31:1247-52. 26. Takada E, Takahashi M, Shimada K. Natural history of lumbar disc hernia with radicular leg pain: Spontaneous MRI changes of the herniated mass and correlation with clinical outcome. J Orthop Surg (Hong Kong) 2001;9:1-7. 27. Miller S, Casden AM. Spontaneous regression of a herniated disk. A case report with a four year follow-up. Bull Hosp Jt Dis 1998;57:99-101. 28. Benoist M. The natural history of lumbar degenerative spinal stenosis. Joint Bone Spine 2002;69:450-7. 29. Slavin KV, Raja A, Thornton J, Wagner FC. Spontaneous regression of a large lumbar disc herniation: Report of an illustrative case. Surg Neurol 2001;56:333-336. 30. Satoh K, Konno S, Nishiyama K, Olmarker K, Kikuchi S. Presence and distribution of antigen-antibody complexes in the herniated nucleus pulposus. Spine 1999;24:1980-4. 31. Grönblad M, Virri J, Seitsalo S, Habtemariam A, Karaharju E. Inflammatory cells, motor weakness, and straight leg raising in transligamentous disc herniations. Spine 2000;25:2803-7. 32. Grönblad M, Virri J, Tolonen J, Seitsalo S, Kääpä E, Kankare J, et al. A controlled immunohistochemical study of inflammatory cells in disc herniation tissue. Spine 1994;19:2744-51. 33. Ito T, Yamada M, Ikuta F, Fukuda T, Hoshi SI, Kawaji Y, et al. Histologic evidence of absorption of sequestration-type herniated disc. Spine 1996;21:230-4. 34. Haro H, Crawford HC, Fingleton B, MacDougall JR, Shinomiya K, Spengler DM, et al. Matrix metalloproteinase-3-dependent generation of a macrophage chemoattractant in a model of herniated disc resorption. J Clin Invest 2000;105:133-41. 35. Haro H, Komori H, Kato T, Hara Y, Tagawa M, Shinomiya K, et al. Experimental studies on the effects of recombinant human matrix metalloproteinases on herniated disc tissues-how to facilitate the natural resorption process of herniated discs. J Orthop Res 2005;23:412-9. 36. Marshall LL, Trethewie ER, Curtain CC. Chemical radiculitis. A clinical, physiological and immunological study. Clin Orthop Relat Res 1977;129:61-7. 37. Modic MT, Masaryk T, Paushter D. Magnetic resonance imaging of the spine. Radiol Clin North Am 1986;24:229. 38. Atlas SJ, Keller RB, Chang Y, Deyo RA, Singer DE. Surgical and nonsurgical management of sciatica secondary to a lumbar disc herniation: Five-year outcomes from the Maine Lumbar Spine Study. Spine 2001;26:1179-87. 39. Weber H. Lumbar disc herniation. A controlled, prospective study with ten years of observation. Spine 1983;8:131-40.